In the space industry, the design, building and testing of rover prototypes is extremely expensive and system testing typically does not occur until late in the design/testing process, leading to a long development time. In response to this, Dr. Amir Khajepour, Canada Research Chair in Mechatronic Vehicle Systems and Professor of Engineering in the Mechanical and Mechatronics Engineering department at the University of Waterloo (UW), and his team worked with the Canadian Space Agency (CSA) and Maplesoft, to develop a Hardware-in-the-Loop (HIL) test platform for solar powered planetary rovers. Their approach allows component testing within a simulation loop before a full rover prototype is available. It essentially creates a virtual testing environment for the component under test, “tricking” it into thinking it is operating within a full prototype. Using MapleSim, the modeling and simulation tool from Maplesoft, high fidelity and computationally efficient models were created for this real-time application. 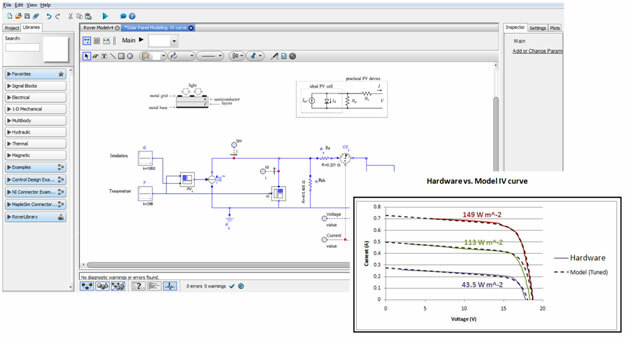 Using this test platform, scenarios that are hard to replicate in a lab setup, such as the Martian environment, or components that are not yet available, can be modeled while hardware components that are available can communicate with these software models for real-time simulations. The goal is to progressively add hardware components to the simulation loop as they become available. In this way, system testing takes place even without all the hardware components, bridging the gap between the design and testing phases. The main advantage of this approach is that it significantly reduces the overall development time in the project. In addition, this allows for component testing under dangerous scenarios without the risk of damaging a full rover prototype. In addition to simulating the rover dynamics, the MapleSim modeling environment was used to automatically generate the kinematic equations of the rover. These equations then formed the basis for other tasks in the project such as HIL simulations, path planning, and power optimization. The modular system setup enables users to quickly change the rover configuration and explore different approaches in a short time. Figure 2 shows an overview of the test platform. 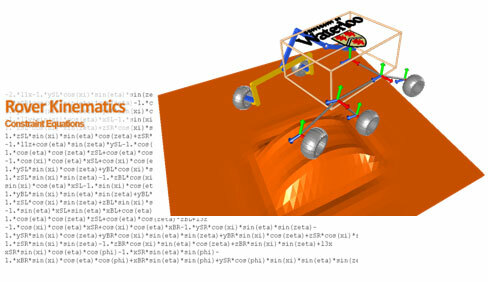 Information regarding the rover’s position, orientation, tilt, speed, and power consumption (obtained from dynamic models of the rover) is used as input to the software models. 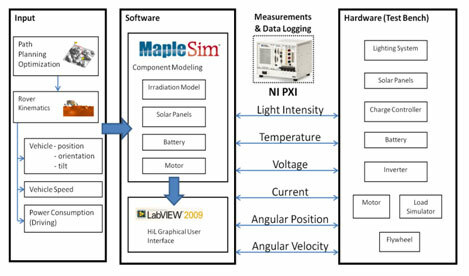 A library of rover components was developed within MapleSim and imported within LabView Real-Time where the HIL program and GUI of the simulations were developed. The program was then uploaded to the embedded computer within National Instruments PXI where communication between the hardware components and the software models was established and the real-time simulation was run. In addition to making use of MapleSim’s built-in component library, custom components were also easily developed. A model to estimate the solar radiation that a tilted surface would receive on Mars was implemented using MapleSim’s Custom Component Block. This model took into account the sun’s position, the rover’s latitudinal and longitudinal position as well as orientation and tilt as it traveled from point A to point B. This was used together with a solar array model to estimate the power generation of a rover throughout the day. The team also used MapleSim as a key tool in an earlier part of the project to develop a full solution for the power management system of autonomous rovers. 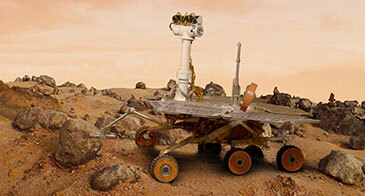 They used MapleSim to rapidly develop high fidelity, multidomain models of the rover subsystems. The goal was to develop a path planning algorithm that took rover power demands (and generation) into account. Using the models developed, the path planner found the optimum path between point A and point B, such that the rover maintained the highest level of internal energy storage while avoiding obstacles and high risk sections of the terrain. Dr. Khajepour and his team were able to create the mathematical model of the 6-wheeled rover without writing down a single equation. “MapleSim was able to generate an optimum set of equations for the rover system automatically, which was essential in the optimization phase,” he said. Dr. Khajepour was also impressed with MapleSim’s graphical interface. “In MapleSim, you can simply re-create the system diagram on your screen using components that represent the physical model. The ability to see the model, to see the moving parts, is very important to a model developer,” he concluded.